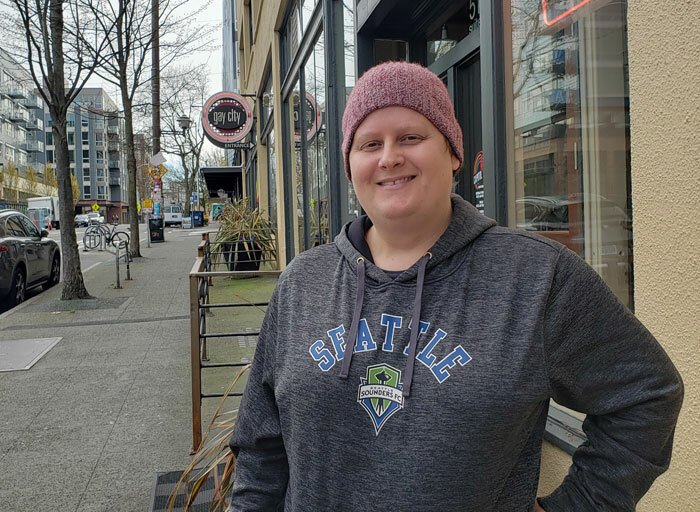 Photo by Brandon Macz: Sara Brereton says she's running for Seattle City Council District 3 and won't be holding back her opinions on the big issues facing the city. Sara Brereton told her wife that if she ran for city council, she would do it without a filter. Not all of her opinions will be popular, she said, but her stances on the issues are far different than District 3 Councilmember Kshama Sawant’s five other challengers. Brereton is the former owner of 701 Coffee in the Central District, which closed in early 2018. She partly blamed the impact from the 23rd Avenue improvement project and a lack of support from the city as the reason the business folded. Former mayor Ed Murray did roll out a $650,000 stabilization fund to assist those small businesses along the 23rd Avenue corridor impacted by the lengthy construction. She still sees small businesses closing in the Central District. “There are some here and there opening but, for the most part, a lot of these small businesses have a lot of backing that a lot of small, family run businesses have trouble accessing,” she said. The District 3 candidate wants to see the city grant money to organizations that really help people start a small business. “I’m talking substantive interventions that get people from the early part of an idea, to a business plan, to establishing if this is a viable business or not,” Brereton said. Brereton is a product of generational poverty, she said, and has been homeless before. The last time she went through the city’s shelter system was seven years ago. She ended up in low-income housing, and then moved her family above the Central District cafe in 2014. Now she works for UPS and lives in a Capitol Hill Housing apartment with her wife and two of their four children. The homelessness crisis in Seattle, she said, was well documented in KOMO’s “Seattle is Dying” special. Brereton doesn’t like seeing homeless encampments in her neighborhood or anywhere in the city, and she doesn’t like that those experiencing homelessness have the choice to continue living on the streets, she said. Brereton believes some people living unsheltered have drug addictions and are not ready to accept treatment, but she also believes some have grown comfortable with the freedom from homeless life. She said 80 percent of people offered housing rejected it prior to a homeless encampment sweeps. A city memo from the Navigation Team notes that in 2017, its first year operating in the city, 37 percent did accept safer shelter and 32 percent declined all offers of shelter and other services. Brereton said Sawant supports policies that allow people to sleep in “tents and sheds,” referring to tiny house villages. “I mean, we literally have shanty towns that are funded by the city,” she said. There are those living unsheltered with mental health issues who can’t take care of themselves, Brereton said, and they should be committed. “One of the options shouldn’t be continuing to be homeless,” she said. Brereton prefers a 24/7 shelter model for others experiencing homelessness, and acknowledges some may need to be low barrier. If a safe consumption space were considered within such a shelter, she said, she’d be more open to discussion, but not on its own. “It’s enabling self-destructive behavior, and I can’t support that,” she said. The District 3 candidate said the Seattle Police Department has been too lax on property crimes. If someone in addiction commits a crime in order to purchase drugs, she said, they should be prosecuted. She said Sawant’s criticism of SPD has created a “toxic narrative” that doesn’t help. “I do firmly believe that Seattle is dying when police are not allowed to do what they need to do,” Brereton said. An employee-hours (head) tax on businesses reporting more than $20 million in gross receipts that the city council passed and quickly repealed last year was expected to generate additional funding for affordable housing and homeless services. Sawant continues to push for taxing Amazon and other large tech companies in Seattle to help resolve the affordability crisis she argues they created. “Kshama’s approach to the head tax was a circus,” Brereton said. Amazon and other tech companies have other valuable resources to offer, she said, not just tax revenue. “The only solution that Kshama seems to have is building more low-income housing in gentrifying areas,” she said. Capitol Hill Housing and Africatown recently opened the Liberty Bank apartment building that is providing 115 affordable housing units in the Central District, and is at more than 80 percent black occupancy. The Central District is a quickly gentrifying neighborhood in Seattle with deep roots in the African-American community, but many residents are being priced out. While Brereton said she’s happy to see a high occupancy rate for black residents at Liberty Bank, she believes low-income housing only further entrenches them in the same economic state they’ve been in for decades. “If that isn’t a different version of redlining, I don’t know what is,” Brereton said of Liberty Bank. Brereton doesn’t plan to launch a campaign website, but will be knocking on doors and engaging with voters on Twitter @D3ForSaraB.